You need a reliable upholstery supplier in order to run a successful upholstery shop. Try these sources for finding good upholstery suppliers. After finishing upholstery training and finding the right location for your upholstery shop, you will need to find good suppliers. When setting up a small business such as an upholstery shop, it can be hard to find the right suppliers. I tried all of the methods listed during my years as a professional upholsterer, and each method served the purpose of leading me to a supplier who provided the wholesale materials needed to complete the job. Word of mouth - Check with other upholsterers to see if they are willing to share names of their suppliers. Some will be willing to share, while others may want to keep their fabric sources a secret. If the first shop manager you contact does not want to share the information, contact another one. The benefits of this approach are that some managers will go as far as giving you the phone number and address of the supplier. You can get a look at the quality of materials from different suppliers. Finally, some people like to talk about it when they have a bad experience with a business, so you can use this method to weed out unreliable upholstery suppliers. Internet auction sites - Start by checking the seller's rating and comments from past customers if you are considering buying upholstery supplies or tools from an Internet auction site. Avoid sellers with poor reviews. As long as you are careful in researching the seller before committing to the purchase, you can save a lot of money on upholstery materials, sometimes even going below wholesale prices. The main drawback of buying this way is you might have a hard time returning or matching the fabric if you run into a problem. Trade and specialty magazines - Trade magazines are loaded with articles about other shops, new techniques, and new products plus where to get them, and finally advertisements placed by hopeful suppliers. You can use the provided contact information to request samples or swatch books and to get information about setting up an account. Specialty magazines contain similar information and ads, so do not overlook them as a source if your shop specializes in a specific type of upholstery. Internet search engines - If none of these other approaches for finding an upholstery supplier fill the bill for you, use your favorite search engine. Even if you already have a favored wholesale supplier, this approach can be helpful if you are looking for hard-to-find materials or specific brands. Manufacturers - If you are looking for a specific brand of fabric or upholstery tools and cannot find a supplier, you can contact the manufacturer for help. Some manufacturers use only a limited number of suppliers, so this can often save you time when searching. You can sometimes also find shops and factories that have gone out of business and purchase their unused inventory at a fraction of the original price. This will not provide you with a reliable wholesale supplier, but it can help to build up your shop's inventory. Polypropylene is a durable material, but it can get holes in it. When it is an awning that has a hole, anything stored under that awning is going to get wet. Also, exposure to wind and rain are going to turn a tiny hole into a big, frayed mess if you do not do something to stop it. If you have any modern polypropylene feed sacks and a heavy duty sewing machine, you already have exactly what you need to patch a torn polypropylene awning. Before you start cutting and sewing polypropylene patches on your awning, clean the awning. This will help keep grime out of your sewing machine's inner workings. Cut the patch from an old feed-sack, making it at least two inches larger than the hole, all the way around the hole. If possible, match the feedsack color to the awning's color. Place the polypropylene patch over the hole. You do not need to fold the edges of the patch under to prevent fraying because feed-sacks are coated and the coating prevents fraying. Sew all the way around the patch, 1/4-inch from the cut edge. This will be awkward if the awning is large, so be patient and carefully work the excess polypro out of the way to avoid sewing through the wrong layer of fabric. Use a stick of tent-seam sealant to coat the exposed stitching. Tent seam sealant kind of looks like a tube of lip balm and is available in stores that sell camping supplies as well as online. Patching a damaged awning will not make it last forever, but it will get you through a season or two before you have to invest in a new one. More on the Epi Pen belt case I'm working on.... 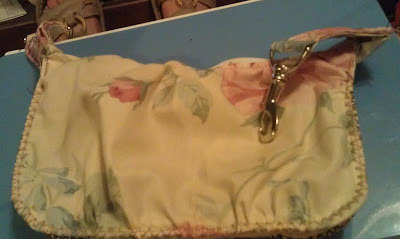 I used the box x stitch to attach the belt loop because it is considered one of the strongest stitches. Hi, This is the prototype Epi Pen belt case I'm working on... I'm open to suggestions if you have anything you would like to say about it. 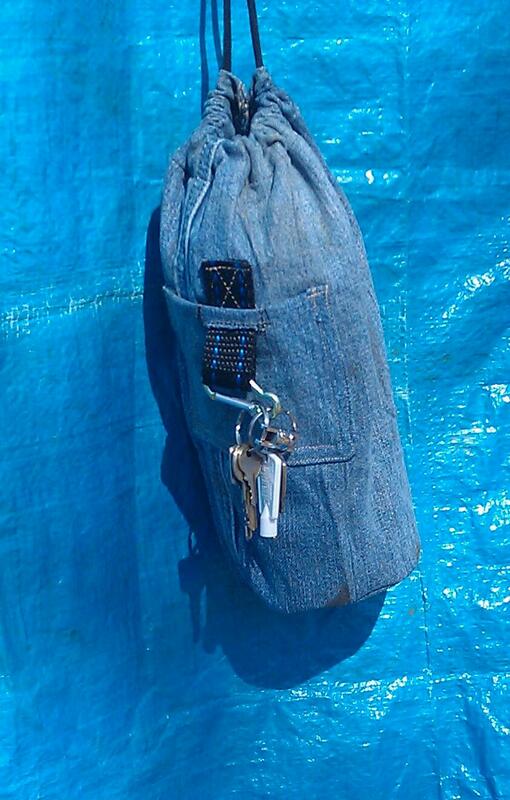 Check out my latest smartphone bag prototype. I'm still trying to perfect the design. This pouch has an inner padded pocket to protect a smartphone, a puffed out side pouch to hold an asthma inhaler or set of keys, and a third pouch to keep your money, is, or credit cards. To finish it off, I added swivel clips to hook on belt loops. If I get the pattern right, I'll offer a detachable strap as an option. I also reinforced the bottom and side panel for extra durability. Cleaning your serger will be easier if you remove the thread, but threading a serger can be a challenge, so I'm going to give you a tutorial that lets you clean around the thread. It takes a little extra patience and a steady hand, but it is possible. If you start to get frustrated when following this tutorial on how to clean a serger, take a short break and then come back refreshed to finish cleaning your serger. Clean the outer case of the serger first. Dip the paintbrush in the water and rub the wet brush against the most heavily soiled areaas on the machine. Slide the brush under the threads as needed, without lifting up or moving the threads. Let the water soak into the soiled areas for about three minutes, then fold a paper towel and wipe the moisture and grime away. Slide the point of the paper towel under the threads the same way you did the paintbrush. Clean the entire outer case first, then open the cover to expose the serger's loopers. Dry the paintbrush before touching the loopers. Gently brush and flick loose thread and fabric fibers out of the looper area of the machine. If you get any water on the shiny metal loopers, apply a drop of sewing machine oil and use the brush to spread it around so it covers the metal that got wet. This is to prevent the wet spot from causing your loopers to rust. Check the threading to make sure nothing came loose, then replace the lower looper cover. Tip: If you have access to an air compressor or a can of that compressed air that computer techs use to clean computers, you can blast the fibers out of the looper area instead of brushing them out. Either way will work, but blasting it with air is more likely to pop threads out of the loopers tan gentle brushing is. I will try to get on here tomorrow and add at least one of these how-to's, and the other by the next day. If I forget and you need the info, drop me an email at LaureJ@consultant.com to remind me to get it in gear and get them on here. I might also add a couple of things specific to a Singer MerrittLock Serger; like the other, drop me a note if you need the info before I get it posted. Powerful industrial sewing machines can sew through heavy material other machines cannot touch, but they can be dangerous if you do not use them right. Driven by a powerful 1/2 to 3/4 horse motor, the needle on an industrial sewing machine can slam down with a hammer-like force up to 5,000 times per minute. High-speed powerful impacts mean operators need to be careful when sewing or maintaining the machines in order to prevent injury. Wearing personal protective equipment, or PPE, and paying attention to the rules for safely operating these high-speed sewing machines can help keep you injury-free. Industrial sewing machine operators should wear two main types of personal protective gear: eye protection and hearing protection. When an industrial sewing machine is running full-speed, the needle gets hot from the friction created by rapidly piercing the fabric. Wearing eye protection can save an operator's eye-sight. If the hot needle hits a thick spot in the material, the needle can shatter, sending potentially blinding metal shards flying toward the operator. If only one industrial sewing machine is running in a room, hearing protection is usually optional. If several industrial sewing machines are running at the same time, as in a factory setting, the volume can damage a machine operator's hearing. Wearing a comfortable pair of foam ear plugs or head-set ear protection is less costly than the loss of your hearing. Some rules for operating an industrial sewing machine also apply to household sewing machines, such as: do not leave the power on when the machine is not in use, and do not let small children or animals play around the machine when the power is on. If the power is on, and the treadle accidentally gets pushed down, the best you can hope for is a jammed machine and the worst is someone getting seriously injured. The next rule, possibly the most obvious but also the most important, is watch where you are sewing and do not sew your fingers. If the machine has finger guards in front of the needle, do not remove them, even if they are inconvenient to work around. If the machine does not have finger guards, see about getting them installed. They are less expensive than the medical bills involved with an injury caused by an industrial sewing machine. As an industrial sewing machine operator, you have the responsibility to keep yourself safe. If you do not wear the necessary protective gear, you are the one who will feel the pain when something goes wrong. If you work for someone else and they do not provide eye or hearing protection, you should either ask them for the needed PPE, or pick it up yourself as soon as possible. If you leave the power on when working on the machine, or you let your fingers get under a moving needle assembly, you will be the one hurt. Watch ahead when you are sewing and slow down before you hit thick seams or material. Keep yourself and others safe by turning the machine off at the switch or unplugging it when it is not in use. If reuse, recycle, restyle is your mantra, you can transform an old pair of pants into a shoe bag with compartments. The legs of an old pair of pants can be restyled into a compartmented shoe bag, saving the expense of buying a new tote bag for shoes. Reusing the fabric also keeps a little bit of excess garbage out of the landfill. Make sure the shoes slide inside the pants leg before cutting the pants. You will get the best result from pant legs made of lightweight fabric, but you can use pant legs made of thicker materials, such as denim, if desired. If you use pant legs made of heavy fabric, you will need a heavy duty sewing machine. Turn the pants right side out. Line up the side and inner seams so you are looking at a side view of the pants. Make sure the hems are straight. Fold the center front and center back of the hem 1 inch inward. You can just tuck or push the fabric in with your fingertip. The fold will allow a little bit of extra ease, or space, when you put your shoes in the bag. Pin the pants legs closed and the folds together, right on or just above the hems. Place one of the shoes on top of the pants, 3 inches from the pinned, hemmed end. Measure 6 inches past the heel of the shoe and make a mark, using the fabric marking pen. Then place the yardstick or ruler horizontally across the pant legs and draw a straight line. For most pants, you will only need to mark the top layer of fabric. Set the shoe aside. Cut the pants legs off, using the scissors and following the drawn line. Sew the folded hems together, through all of the layers of fabric. If the material is too thick to go through your machine, sew just above the hem where the material is thinner. Remove the pins. Set the sewing machine to make a finishing stitch, then sew around each cut leg opening. Fold the edges under 1/2 inch. Set the machine back on a straight stitch. Sew around the leg openings again, stitching right on top of the finishing stitches. Fold the center front and center back folds the rest of the way up the legs, until you reach the top edge. Pin the inner folds of fabric on each side together. Sew the center front 1/4 inch from the folded, pinned edges, starting 3 inches from the closed-off hemline. Do not sew through the outer folded layers that are not pinned. Repeat on the center back. Position a grommet on each outer section of fabric just below the top, finished edge. Center the grommets in the outer parts of the fabric. Use the grommet tool to set the grommets. Feed the drawstring through the grommets, and tie the ends together in a tight knot. More than four grommets can be used for a tightly closed bag, but four is the minimum you can use without the shoes falling out. Fewer grommets will leave a droopy, uneven opening. If you are dreaming of turning your sewing hobby into a business but don't have tons of cash to invest, you can still make your dreams a reality with a bit of extra ingenuity. You can reduce the start-up cost of an eco-friendly tote bag business by using unconventional material sources. If the environment is an important issue for you and the weak economy is making it hard to find a job, consider starting your own green tote bag business. Starting your own earth-friendly business is a way to be kind to the planet while earning money. Taking advantage of unconventional fabric sources lets you get started without investing a large amount of money. Let's start by considering ways to save money on materials. One way is to buy fabric wholesale, in bulk quantities, but when getting started, you might not want to invest in buying rolls of wholesale material. Also, using unconventional fabric sources is more eco-friendly than buying new materials at wholesale prices. With the current popularity of recycling and up-cycling, you can cut your material costs by scouring thrift shops, auctions, and garage sales. Look for garments and other textile items that are in good condition. If you opt for garments as your fabric source, look for large and plus-sized clothes, but don't rule out smaller sizes. Smaller garments can provide unique fabrics to use for trim pieces, such as straps and pockets. Since you are making your eco-friendly shopping totes to sell, you will need to spend a little extra time making sure the fabric is in pristine condition. Stains and weak spots in the fabric will leave you with a bad reputation and unhappy customers. Check the garment's care tag and launder according to the directions provided. Cut the fabric right along the seam lines. Also, snip the threads holding buttons and zippers in place, unless you want to leave them for decorations. You can save the buttons and zippers for other projects, or sell them in bulk to other seamstresses. While traditional shopping totes do not have buttons or zippers, you can add them as design features as desired. Now that you have some inexpensive fabric ready to make your totes, it's time to get creative. You can buy a pattern to use for making your tote bags, but copyright laws limit your use of purchased patterns. Your best option, if you want to get started without spending a lot of money, is to design your own tote bag or enlist the help of a skilled sewing friend. When you make up your first few tote bags, take notes on how long it takes to make each bag. Also, note any problems you run into, regarding your pattern's design and how you solved the problem. The notes will help you perfect your design and steam-line your manufacturing process. It will also help with employee training when you get ready to hire a helper. The Internet also offers a number of selling options. Auction sites, such as eBay, online selling sites such as Etsy and eCrater, and setting up your own blog or website to showcase your work are all viable web options. No matter how you market and sell your totes, be very clear with potential customers about your fabric source. If you are not specific, customers will assume you are using new fabric unless you tell them otherwise, and they will feel deceived to find out the material is recycled or up-cycled after they have purchased from you. Describe your fabric sourcing choices in a manner that stresses the eco-friendly value. You are keeping these textiles out of landfills. Water is not being wasted to grow cotton to make new material. Petroleum is not being wasted to manufacture synthetics or to ship the materials. Finally stress that recycling materials keeps your costs as a manufacturer down, and that the savings are passed along to the customer. Using unconventional fabric sources to make green shopping totes is a win-win-win situation. You win because you can operate your business with low overhead costs. Your customers win because they get unique tote bags they can feel great about using. Finally, the earth wins because waste is practically eliminated when unconventional fabric sources are employed. Sewing Supplies image courtesy of Clarita and MorgueFile. 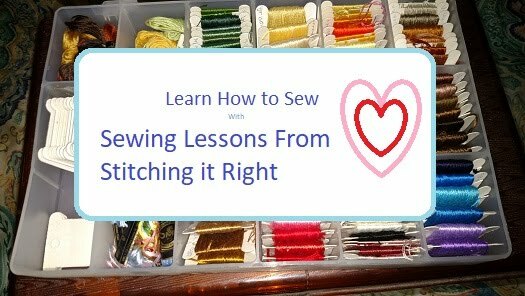 What do you do when you are sewing and you MESS UP? For me, it depends on the size of the mess up and the amount of stress I am under before the mess up. Sometimes I can keep my cool and figure out what to do with no major upsets. Other times, I ball up what I'm making, stick it in a bag, walk around muttering for a while, and eventually go back to the project. Sometimes it takes months to go back to it, other times just a few minutes. Something about walking away gives me a chance to calm down and think about something else. Then, when I'm thinking about something else, the solution to fixing the sewing mistake comes to me. Anyway, after that vague intro, I'll just say my most recent sewing project turned into a big mess up, and I need to get back to my muttering and doing something else so I can figure out how to fix this mess. So, anyway, what DO you do when you are sewing and you mess up? I would love to hear your ideas if you have a moment to share. Material image courtesy of jdurham and MorgueFile. Hi Everyone, I'm sorry I haven't been posting much here lately; had a few things to finish up. As far assewing, most of my recent projects have been repair work... patching jeans, patching an awning, nothing too fun or creative. I have some projects underway, and read a tutorial on making a ramen noodle package into a change purse (too cute) that I might try. How do you think it will look if I make one out of a polypropylene feed sack? I think it will be cute, but the drawstring will be tricky. If it works out I'll be back with a snapshot. A flat-felled seam is durable with a double line of stitching and completely encloses the fabric's cut edge. It is commonly used on jeans and is also sometimes used on baby clothes. A sewing machine works best for this type of seam, but if you don't have access to a sewing machine you can make this strong and attractive seam finsh by hand-sewing. Learning a new seam finish, especially when hand sewing, is best done on fabric scraps before attempting a garment. To get started, use 2 rectangle pieces of fabric, about 3"x5". Place the squares with the wrong sides together and long sides lined up evenly. Use a threaded hand sewing needle to sew a line of back-stitching 5/8" from the fabric's raw edge, pick one of the long edges to get the most practice. Open out the body og the rectangle fabric. Slide the tip of a pair of scissors between the layers of the 5/8" seam. Trim off the top layer of seam fabric 1/4" from the seam. Wrap the longer, uncut seam fabric around the newly cut shorter edge and finger press it down flat against the body of the rectangle fabric. Use pins, if you prefer to sew with pins, or just work the fold into place as you sew if you do not enjoy using pins. Hand sew a scond line of back-stitching about 1/16" from the folded edge that wraps around the cut shorter edge. If you used pins, go ahead and remove them as you sew so you don't end up poking your hand. When you are confident that you have this seam finish down, pick a pattern and some fabric and cut everything otu according to the pattern's directions. Instead of putting the fabric pieces together with the wrong sides out, put them together with the right sides out. Sew the seams in the order the directions recommend, just take the time to hand sew the flat-felled seam finish you practiced on the fabric scraps. Expect it to take a lot longer than sewing with a machine. Flat-felled seams create a sturdy seam and they provide a polished, finished look that's hard to beat. For more information, feel free to leave a comment below or use the contact form provided. Content prepared by Laure of Justice Writing Service. If you enjoy quilting, a day-long holiday has been named in your honor. National Quilting Day. So get out your quilt squares and needles and sew the day away - if you feel like it. With this year already flying past, I want to share some information with you about National Quilting Day. It will be here and gone before you know it. This quilter's holiday falls on the third Sunday in March and you can read more about it and its history here. Are you looking for a new type of sewing project or maybe a way to teach electronics to children? E-Textiles might just provide the answer to your need for a new sewing challenge - or a unique lesson plan. I'll give you the short description of e-Textiles (clothes or bags that flash or sing, pretty much anything textile with added lights or sounds) and then refer you to a great article called What Are e-Textiles? Get Started With Soft Circuit Electronics. The article even gives you some tips on where to search for the items you'll need to try your own e-Textile project. One of the most important lessons you pick up when learning to sew is that it's beneficial to follow each step. Ironing is an easy step to skip, but skipping it will show in your finished garment or any kind of sewn project. 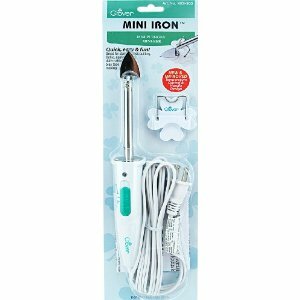 Mini irons offer the convenience of a an easy-to-grab iron while avoiding the bulk and the occasional tediousness of a traditional iron. A mini iron is simply a tiny version of a traditional iron. They are the perfect size for pressing a seam on a garment or when quilting. They also slip nicely into delicate corners and are perfect for working around trims. As far as disadvantages, well, they're small, so while one can be used to press a large item, the size makes them less than ideal for pressing entire garments. I usually recommend fabric marking pens for home sewing projects and custom designing fabric pieces, but really, the pen versus pencil debate ends up being just a matter of personal preference. Clover brand water soluble pencils work with every bit as much precision and they wash away without a trace. I like that this three-pack of water soluble pencils comes in three colors, so I can choose the color that stands in sharpest contrast to the color of fabric I'm working with, then it just washes away when I'm done with my projects. If you would like to check out this product on Amazon, you can click the picture or look for it in the Stitching it Right Online Store tab found at the top of this page. You can also find these or similar fabric marking pencils in fabric stores and craft shops. Prices will vary, but I usually find the best deals on general sewing supplies on Amazon. If I don't get sidetracked, I plan to post a series of short articles about some convenient and cool sewing gizmos I have been trying out. Some are more convenient than cool while some run heavier to the cool side. My first pick is a handy, and kind of organized, cool gizmo. It's the Fiskars 12-in-1 Sewing Tool. In fact, it's really more of a case that holds some sort-of related sewing tools in one convenient, little almost pen-shaped case. What I like about this tool is, simply, the convenience of having all these little tools together in a case that's actually a convenient size to grab in a hurry when I'm working. Note: This is NOT a paid endorsement, I just want to share my experience with this tool since this is ablog about sewing and I think this is a nice sewing tool. If you have a different opinion, or if you have tried this tool and share my opinion, I invite you to share through the comments box below or send me a note through the contact us link if you prefer to reply without leaving a comment on site.